Perhaps Irish Neutrality Is A Sham, But Shouldn’t We At Least Discuss This Issue? On a cold Thursday night in November, a few dozen of us congregated in a beautiful but obscure new lecture hall on the western outskirts of the sprawling campus at NUI Galway. Two Members of the European Parliament (MEPs), four TDs, academics, and peace activists had gathered for a lively and informative three hour discussion which garnered little or no media attention. I know, because I asked three news editors in advance of the meeting if they would be interested in a piece. Not one of them even replied. The subject of the meeting was the thorny question of whether or not Ireland is being steamrolled into joining a European Union army since PESCO – Permanent European Security/ Military Co-Operation – was rushed through the Dail last December. In theory at least, Ireland is a “neutral” country. 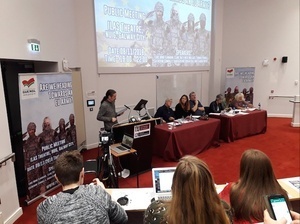 Luke ‘Ming’ Flanagan, the Independent MEP, called the Galway meeting in response to growing alarm over what PESCO actually means to Ireland. Are we on our way to becoming part of a European ‘Super State’? Is our military spending going to increase dramatically to €6 billion per year (or half of what we spend on our desperate health service) because of something our country signed up to with so little debate last year? It is astounding that we hear so much about Brexit on the national airwaves every day, because Britain’s shambolic departure from the EU has such massive implications for Ireland, but we hear little or nothing about the contentious issue of a European Army. Are ‘Ming’ and the Independent TDs just alarmist crackpots? 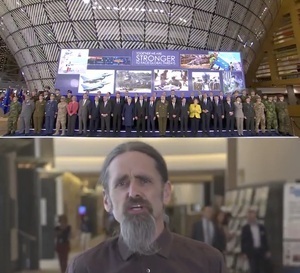 Is it really acceptable that unelected EU officials can lead us toward the formation of a ‘super’ army to rival those of the USA and Russia in the future? And why, oh why, are so few Irish people talking about this? 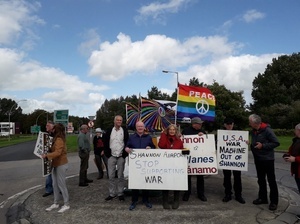 In Shannon last week, the important Shannonwatch peace group noted that a US military plane stopped off in a civilian airport on its way to and from Tel Aviv. Nobody in authority Shannon ever checks the contents of the US military machines which have been landing there each and every week since 2001. Last year, over 61,000 US troops stopped off in Shannon on their way to and from wars in the Middle East. That might mean a hell of a lot of leprechaun and whiskey sales in the duty free shop, but it also makes a mockery of the concept of Irish neutrality. If it wasn’t so serious, Irish people would be laughing over Brexit and the shambolic way in which pro-Brexit politicians in Britain, in their jingoistic haste to leave the EU, seem to have had no vision for the future. Perhaps reform, rather than withdrawal, might be the correct response to an undemocratic, unaccountable Europe; but at least in Britain they have had some sort of debate about the EU and their country’s place in it. The Irish, meanwhile, see ourselves as “model” Europeans even though it was our EU masters who forced us into the “bank bailout”, with devastating implications in terms of the loss of public service jobs, health care and welfare cuts, the privatisation of state assets, and a new wave of emigration at the start of this decade. Not to mention the huge debt our country has been saddled with for years to come. Now PESCO, according to the Independent TDs and MEPs, will see Ireland being steamrolled into an EU Army and it is quite amazing how little talk there is about this in Ireland. “We have to work on a vision of creating a real true European Army,” said German Chancellor Angela Merkel this week. French President Emmanuel Macron called for the formation of a “real” European Army during the Armistice Day commemorations last weekend. On Tuesday, the European Commission said that a European Army is “likely” to be formed one day. So the Galway conference this week seemed to be extremely timely. 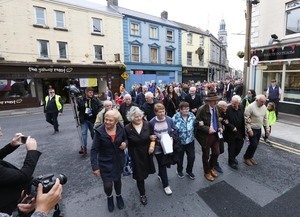 She said that Irish soldiers have to rely on family income supplement in order to survive, in the middle of unprecedented crises in health care and housing. Deputy Connolly pointed out that the head of the European Commission has never been elected by anyone and spoke of how uncomfortable she felt when he was given a reverential reception in the Dail. A Fine Gael MEP, Brian Hayes, has called for the “redefinition” of neutrality and both Fine Gael and Fianna Fail have denied that PESCO will impact on Irish neutrality. Independent MEP Flanagan has described the massive global arms industry as an “untapped goldmine” in the eyes of the European Union. Just as US President Donald Trump feels that punishing human rights abuses by Saudi Arabia would only be foolish if it damaged his country’s $110 billion arms trade with Riyadh, perhaps the Irish should be far more honest with ourselves. Does our ‘neutrality’ mean anything when we get a chance to cosy up to and find favour with the world’s military powers? Do we want to stand beside the French and Germans as they, too, aim to become global powers? Perhaps, ultimately, the vast sums of money to be made from militarisation are far more important than the human rights of children in Syria, Palestine, Yemen or Afghanistan as the US military aircraft land and take off from Shannon Airport with total impunity every week. Next time you have a loved-one lying on a hospital trolley for 48 hours, or finding it impossible to find an affordable place to live, remember that PESCO is set to increase Ireland’s military expenditure six times over. Sometimes, when you look at the stories which are creating headlines, it’s just as informative to check out which stories are being ignored. When a ‘neutral’ former colony wants to be part of a new global super-power, when arms sales are more important than human lives, language truly has been stood on its head. Neutrality means next to nothing when we have dollar signs in our eyes. Posted in Misc and tagged Ciaran Tierney, EU Army, PESCO at 11:47 am on November 16, 2018 by Ciaran Tierney. You’ve been had yet again. Meanwhile the UK is about to bend over & take one from the EU – without consent. The UK is good, Ireland bad. Speaking of being had, how’s the NHS doing with that extra £350M per week? These people don’t seem to know the the difference between ‘Neutral’ and ‘Helpless’. Keep up Dave, the meme is “neutral” versus “defenceless”, don’t dilute it with “helpless”, next you’ll try to stretch it to “Hitler appeasers” and you collapse the whole falacious edifice, and then, where will you be. Ireland is neutral, we don’t get involved in other people’s military disputes. We maintain a small standing army, air corps and navy and that has worked out fine for us in the past 100 years. We provide peace keeping personnel and equipment, and we’re well-regarded for these efforts. We’re not ceding neutrality, unless a majority wants it (which they definitely don’t) and we’re not increasing our military spending. Get over it. This issue has rumbled on ever since I was politically aware. On the one side you have people who make alarmist claims about the future that generally never come to pass. On the other side you have an establishment which preserves the status quo but never makes a positive case for it. (Twould almost remind you of Brexit, but I digress). The expertise rests entirely with the defence forces and a small group of senior civil servants. Neither of these groups is ever heard from. Occasionally a minister wants a policy change, but silence in the intervening period. There is, to my knowledge, no analyst or specialist in an NGO who is knowledgeable about these issues in Ireland. There are some serious issues for consideration. It’s a pity that mature debate never seems to take place. Which issues do you mean when you say there are no experts? There are vibrant politics and international relations departments in irish universities, staffed by knowledgeable academics in all aspects of both the neutrality question and the future state of european/global defence needs etc. 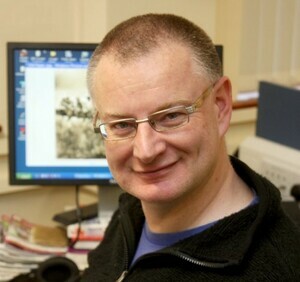 There is almost no one with a military and/or policy background who carries out analysis of defence and security issues in academia. Tom Clonan is the honourable exception, and he has a background in the defence forces. Most politics and international relations academics are heavy on theoretical models. They are very hazy when it comes to policy and practical issues. It is an area where academia and policy could do with a lot more back and forth. The best we can do having signed up to PESCO is to hold the politicians to account on their commitments last December when this was passed through the Dail with nary a mention by MSM beforehand. That’s what happens when you don’t have an Opposition and democracy is decided by culchie TDs who’ve been bought off with a ring road and a new roof for the GAA clubhouse. are you trying to play a game of ‘my government is better than yours’? really? Kudos for using the original form. It adds power to what is already a weighty insult. Ireland is not ‘neutral’ – it is ‘non-aligned’. The use of Shannon was supported by a vote of Dáil Éireann in 2003 (https://www.oireachtas.ie/en/debates/debate/dail/2003-03-20/4/). Although – given the issues at stake and the length of time since – it might be no harm for a bit of further debate. “Is our military spending going to increase dramatically to €6 billion per year?” – which is bad yes? “Catherine Connolly TD said that Irish soldiers have to rely on family income supplement in order to survive, in the middle of unprecedented crises in health care and housing”… which is also bad. So do we increase our spending on defence and pay the soldiers more? or not. You can’t have both. We can increase our spending on defence and not give the soldiers a penny more. A sixfold increase in spending will not mean a sixfold increase in soldiers wages, it will mean spending on equipment and spending on training/preparedness/deployment. Defence Forces pay is indeed objectively poor compared to An Garda Síochana or the Prison Service for quite similar work. But how does it compare to the equivalent ranks in other countries? I don’t think there are comparable international statistics. It’s probably not relevant, as defence forces does not recruit internationally. Pay should be in line with the rest of the public sector, which at the aggregate level should be in line with what is sustainable for the public finances. But comparing the pay of an army private in Ireland and in Italy is not really appropriate. Granted, but if you compare the relative pay between (in your example) a police officer in Ireland with a private in the Irish army; to the relative pay between a police officer in Italy with a private in the Italian army. Foreign deployments are lucrative, but this comes at a personal cost. It’s difficult for a spouse to maintain full-time employment with young children when you are deployed for six months at a time. Anecdotal evidence suggests at the high-skilled end (pilots, IT experts) the defence forces are losing staff at a huge rate due to low pay compared to the private sector. Yes, but joining the army as a private is a zero-requirement job. No minimum education requirement. It is equivalent to many other minimum wage jobs. You also get food and board. For a single person it is great money. For someone with a spouse/kids/house it is awful. There is, however, a minimum education requirement though! Hmm.. I suppose I should have said no qualification required. I didn’t hear much out of Tierney and Flanagan regarding the 8.5 billion a year the working person is paying in Interest each year on debt associated with the nationalisation of private bank debt, and the 3 billion woth of Irish exports that can be used for military purposes. We are not neutral, never were. We still think that a smile, a guinness and god will deliver us from evil. 1. We don’t pay €8.5 billion a year in interest. And never have. About €200m per annum of debt interest is due to the non-imposition of haircuts on senior bondholders back in the day. That’s the running cost of the public health service for about five days. I specifically referred to unguaranteed senior bonds. This was where the scope for policy action (if any) was. yeah Ollie, it was only €8.2bn in 2014 servicing the national debt. €8.5bn, sure that’s completely bonkers and undermines your whole point. The vast majority of that debt was to pay for benchmarking and the social welfare bill though – nothing to do with banks and bondholders. No, if you look at the document you linked to the interest was €7.47bn. A lot of money. But not 8.5bn. Yeah, but if you look at the cost of servicing the national debt, it’s interest, sinking fund and debt management expenses, you know, when you issue or restructure debt, so the cost of servicing the national debt is, for the 12 months of 2014, €8.2bn+. if you look deeper, the €633,177K in the “Sinking Fund” appears twice on page 1 – as a credit and a debt. It was simply moved from one account to another. Right, so when you save €10 a week throughout the year in your Christmas club (sinking fund), and in December when you withdraw the €520 and spend on Christmas,what do you think the cost of Christmas is? Nil, because you’re only transferring money from your Christmas club? Or €520? The cost of servicing the national debt in 2014 was just over €8.2bn. Agreed with Rob above though, that a fraction, probably north of 25% is for the bank bailout, with the rest mostly for funding the deficit (state services, public sector workers, social welfare minus tax receipts) when the downturn hit in 2009. Irish debt is €201bn. Of this, €64 billion is direct bank debt. The majority of the rest is indirectly as a result of the bank colllapse and of the Irish State accepting a liability of 440 billion. 2. Our (gross national) debt in 2007 was ~€40bn (and had been for the previous 15-odd years since Charlie Haughey’s days). This €40bn is part of the current €200bn (approx. 20%). We were borrowing ~€10bn each year between 2007 and 2017 to pay the bills (which is mostly health (25%) and social welfare (33% most of which is pensions and children’s allowances). This was due to the drop of tax when the building industry collapsed (indirectly due to the banking collapse) NOT the state’s exposure to the banking liability. Next time hear of someone spending 48hrs on a hospital trolly should I also get annoyed at all the billions spent on education, or on justice, or on roads. Who decides what money gets spent on? 2 families I know who moved to Ireland years ago, one from Israel and one from Russia, moved here because they did not want their children to do military service or worse have them drafted. I must ask them next time I see them what they think of the PESCO idea …. 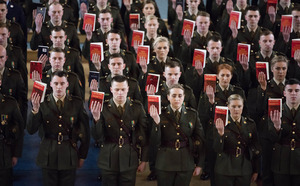 Ireland’s very small defence forces is massively-oversubscribed for recruits as it stands, so very unlikely your (possibly apocryphal) friends’ kids will be conscripted. What, apart from speeches in the Dail, leading and participating in marches and protests, having it as a central plank of his 2014 European Parliament election campaign, employing as his assistant the man who led the Ballyhea bank bailout protests, tackling Draghi/Trichet and Juncker about it when they’ve appeared at the European parliament, frequently referring to it in interviews and media appearances. Fecks sake, he even made this viral video. “Perhaps Irish neutrality is a sham, but shouldn’t we at least discuss this issue?” funny how the Irish Times article who’s editorial ends similarly “That is no reason to refuse to discuss these issues in a mature and vigorous fashion”. https://www.irishtimes.com/opinion/editorial/irish-times-view-on-european-security-a-changing-landscape-1.3699194 I think we no where Ming stands, he fears neutrality is and has been eroded the Irish Times meanwhile pretends that it not pro-ending military neutrality by saying lets discuss it. The bit about the defence budget rising to €6billion is pure daft. The Defence vote for 2019 is €722 million. Pay is almost €500 million of this. Not exactly massive military expenditure here. New Zealand, a similar sized country to us, spends more than twice what we do on its defence forces. Another thing. Our GDP is fiction. GNI* is a more relevant figure (this is about 60% of GDP). I worked at SkyNews during the war in Kosovo back in ’98, it was a news story that was always hanging around in the running order of a bulletin, but never made it to air, until NATO started to bomb – they weren’t sanctioned by the UN. Another “Ethnic Cleansing” exercise in The Baltics, NATO, perhaps reacted too late? Then, it was 24/7 Kosovo coverage from SkyNews. Maybe, a PESCO force if they had interceded, and clearly, of course, had they existed could have saved thousands of lives? The question was though, do Irish people care, or indeed are aware of PESCO? I suspect not so much. The likening to Brexit, I think is a tad unfair. The £350 million a week promised to The NHS as a result of an exit vote was clearly a lie, I don’t think everyone believed the slogans on the side of “The Boris Bus”. If it were to come to a referendum about PESCO – it’s more of a moral issue, rather than identity. The Irish Army is @7,500 men and women who decided this path as their career, why not poll the soldiers first, as they ultimately are in the firing line. Get a majority vote either way, in – or – out? Then based on the results, introduce the civilian electorate? – I suspect your heart is in the right place, but this is a very bad idea. Allowing the military to decide foreign policy, instead of elected politicians, does not end well. Perhaps I see. The Irish Army, however, is one of the few armies in the World, whose major role is peace-keeping. It’s not under duress by Government that they joined, they are all free-thinking citizens. So, sorry, perhaps this is where it starts? The Army decides that they are all into PESCO, or not – then it moves to, as I said a civilian vote. Elected politicians always work out so well? It will be like Brexit – one side will promise them £350 million extra wages. The other side will scare them with war and death. During WWII, American GIs signed a contract of insurance, if they were killed in action, their families would receive $10,000. American soldiers, post 9/11 receive $40,000 when they sign up. Irish soldiers, if not officers receive a little over the NMW. I thought it might be fair to ask, first of all the guys who are directly involved. No promise of extra money per hour isn’t on the table as yet. Not really. -some- positions get a 40k bonus. And they start at only $1400/month. And while our defence forces start at NMW they go up every year.